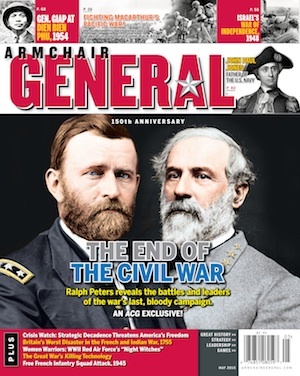 Backstage at the Lincoln Assassination – Book Review | Armchair General Magazine - We Put YOU in Command! Backstage at the Lincoln Assassination: The Untold Story of the Actors and Stagehands at Ford’s Theatre. Thomas A. Bogar. Regnery History, 2013. 377 pages, four pages of photos and illustrations; map of Ford’s Theatre area, 1865. Hardback, $27.95. Few nights in American history have been so thoroughly and repeatedly explored as the night of April 14–15, 1865, when a Southern-sympathizing actor named John Wilkes Booth slipped into the Presidential Box at Ford’s Theatre in Washington, D.C., around 10 p.m. and assassinated President Abraham Lincoln. Yet Thomas A. Bogar found a fresh approach to this well-trod ground in Backstage at the Lincoln Assassination. For the book’s first seven chapters he takes readers through the entire day of April 14 as stagehands, actors and actresses at Ford’s Theatre prepare to put on a performance that night of a comedy, Our American Cousin. The rest of the book’s 15 chapters and epilogue examine what happened after Booth pulled the trigger and ran from the theater. Government authorities scrutinize virtually every person who worked at the theater that day, imprisoning some. Performers and stagehands try to go on with their lives, but as Bogar shows, their careers were often tainted by association. He follows these blighted souls through the rest of their lives (some simply disappeared from any historical record after a time) to show their tribulations and successes. In this respect, Backstage is truly a “now for the rest of the story” book. In the final chapter, Bogar raises several questions, such as “Why did (Secretary of War Edwin) Stanton and his subordinates move so quickly to arrest and interrogate backstage workers, while overlooking actors who might have professional information or insight into Booth’s behavior prior to the assassination?” (Italics are Bogar’s.) Did the atmosphere backstage, where Unionists worked side by side with Secessionists, foster a conspiracy? Did the government plant an informant among the theater’s workers weeks before the assassination? Why were some obvious trails of investigation never followed? Pulling all of this information together must have been a Herculean task, and I tip my hat to Mr. Bogar for that. The 29-page bibliography includes sources from books, manuscript collections, theses, etc. Over five pages are required just to list the newspapers and periodicals used for research. I found this list helpful whenever I forgot exactly who a given character was. The book is full of tidbits of information, which Bogar often uses to create visual images, such as stagehand Ned Spangler wandering aimlessly through Washington in the rain during the hours following the assassination, fearful of the mobs waiting to lynch anyone they might blame for the president’s death. In the middle of the night, he appears on the porch of young actress Jeannie Gourlay, “incongruously cradling a small puppy.” Gourlay’s father turned him away, fearful of opening the family to greater suspicion. Perhaps the most macabre event described in the book is a re-enactment of Our American Cousin in Ford’s Theatre. It required all the cast and crew who could be located to perform the comedy on the afternoon following the assassination, for the benefit of investigators. The question of whether or not that passageway had been kept especially clear of clutter that night or if it was always kept clear to permit actresses in large skirts easy access and egress became a point of contention in the investigation, similar to questions about whether a single bullet killed President John F. Kennedy and also wounded Texas Governor John Connally in 1963. Among other surprising information in Backstage, Will Ferguson, who was a 19-year-old callboy and aspiring actor with a bit part on the night of the assassination, would go on to an acting career that included portraying Abraham Lincoln in the 1915 film, Battle Cry of Peace. Not all the little nuggets of information are related to the night of the assassination. I learned from this book a great deal about the history of theater in America at the time and how changing tastes doomed the careers of many of the performers who were at Ford’s; it is a story akin to how “talkies” killed the careers of the stars of silent movies. The book also shows how the protections afforded by the US Constitution were tossed aside in the government’s drive to find and punish anyone involved in the assassination. One member of the backstage crew was manacled hand and foot for weeks leading up to and during his trial and for prolonged periods was forced to wear a sack over his head, with air holes just large enough to keep him breathing. According to Bogar, he wasn’t even informed of what charges were being brought against him. The descriptions of how convictions were obtained may cause readers to reflect on the current “flexibility” with which Constitutional protections are treated in the wake of the 9-11 terrorist attacks. I have more than two shelves full of books about Abraham and Mary Lincoln. Backstage at the Lincoln Assassination is almost unique among them, for the way it focuses not on Lincoln but on those whose lives became forever linked to him through no choosing of their own. It adds new scenes along a well-traveled path. I recommend it highly to anyone interested in Lincoln, Booth, mid-nineteenth-century theater, or just a captivating work of history that flows well and is easy to read. Gerald D. Swick is web editor for ArmchairGeneral and HistoryNet. He and research partner Donna D. McCreary found the letter that solved a 70-year mystery of why the Lincolns’ eldest son, Robert, is not buried with the rest of the family. Despite all the reenactments and so forth; did anyone take a good look at Stanton’s hands in the whole disastrous affair??? Or did he hang anyone who questioned him as well?